InflammAging affects hematopoietic stem cells (HSCs) through impairing their function and self-renewal by constant activation of cohesin-mediated inflammatory signals. 17-Dec-2018: Organism aging is characterized by increases in inflammation and decreases in stem cell function. The relationship between these processes remains incompletely understood. 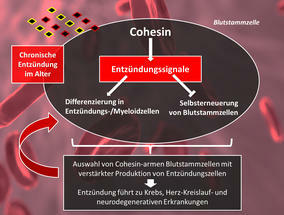 Researchers of the Leibniz Institute on Aging in Jena identified a new role of the protein cohesin in mediating inflammatory signaling in hematopoietic stem cells (HSCs). Cohesin is required for gene regulation during normal differentiation, but chronic inflammation in aging impairs the function and self-renewal of HSCs by constant activation of cohesin-mediated inflammatory signals. HSC with reduced cohesin, increased self-renewal and skewed differentiation are selected, resembling the hallmarks of hematopoietic aging. As the human body ages, inflammation increases and this accelerates the development of aging-associated diseases, a process called ‘InflammAging’. This process also affects the hematopoietic system in a way that inflammation instructs the stem cells of the system (hematopoietic stem cells, HSCs) to exhibit abnormal self-renewal and unbalanced differentiation into inflammatory/myeloid cells, which in turn leads to a further acceleration of InflammAging. The drivers of stem cell aging are still incompletely understood. Gaining mechanistic insights into this process holds the promise to develop therapies to improve health during aging. Researchers of the Leibniz Institute on Aging – Fritz Lipmann Institute (FLI) in Jena, Germany, have now found that the cohesin complex – a DNA clamp-holder – plays an important role in HSC response to inflammation and as such appears to drive key features of hematopoietic aging and InflammAging. A well working hematopoietic system is based on a balanced potential of the HSCs to differentiate into all important cell types of the blood system and to renew themselves as stem cells (self-renewal). During aging and increasing, chronic inflammation, the balance of the hematopoietic system is lost. HCSs show impaired repopulation capacity and skewed differentiation: This means they are more likely to differentiate into inflammatory/myeloid cells than into lymphoid cells. The transcription factor NF-κB controls many genes involved in inflammation. The pathway is activated in many inflammatory diseases. During aging, an increase in NF-κB signaling has been identified in HSCs. However, the functional consequences of enhanced NF-kB signaling on hematopoietic stem cells aging have not been worked out. 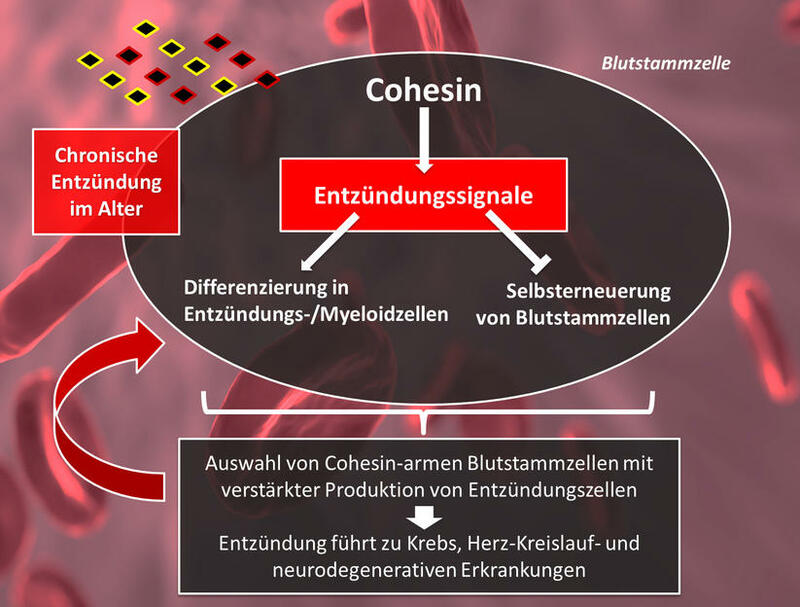 Researchers of the Leibniz Institute on Aging (FLI) in Jena and their collaborators investigated aging and inflammation processes and their effects on the hematopoietic system. “We knew that aging comes along with increased inflammation, but the consequences of chronic inflammation for hematopoietic stem cells and organism aging were incompletely understood”, Dr. Zhiyang Chen, postdoctoral researcher at FLI explains his motivation behind the study. The current study increases our understanding and shows that cohesin mediates inflammatory signaling in HSCs and that this has functional consequences during aging and inflammatory processes. Cohesin turns out to be important for normal differentiation of HSCs, but during aging and inflammation the same regulatory loop limits the stem cell function, especially the self-renewal capacity of the HSCs. Old HSCs fail to down-regulate cohesin-mediated inflammatory signals that remain chronically activated during aging. “This mechanism of constant inflammation exhausts the stem cell pool and pushes the stem cells into faulty differentiation into inflammatory cells”, summarizes Prof. K. Lenhard Rudolph, senior group leader at FLI. “In turn, these impairments increase the selection of abnormal stem cells with lower expression of cohesin that exhibit increases in self-renewal and mal-differentiation into inflammatory/myeloid cells – a hallmark feature of the hematopoietic system, which accelerates organism aging”. Interfering with this molecular loop of chronic inflammation in aging hematopoietic stem cells could help to slow down aging and the development of aging-associated diseases such as cancer, cardiovascular and neurodegenerative diseases that are driven by increases in inflammation.